I am a hydrologist by training, profession and (much more) through a deep fascination with water in all its power and beauty. Given the importance of water to us practically and symbolically, there is more than an element of the sacred. I went on to study Environmental Science – one of the more fun things I have ever done. I combined the two in biogeochemical cycling – the movement of nutrients and pollutants through biota, soils and water. I have spent decades reducing the impact of cities, farms and mines on waterways and the life it contains. As a relatively young environmental scientist – it was apparent that only rich economies can afford environments. The data compiled by the World Wildlife Fund seems to confirm that we in the west are at least holding the line on the abundance of key populations. 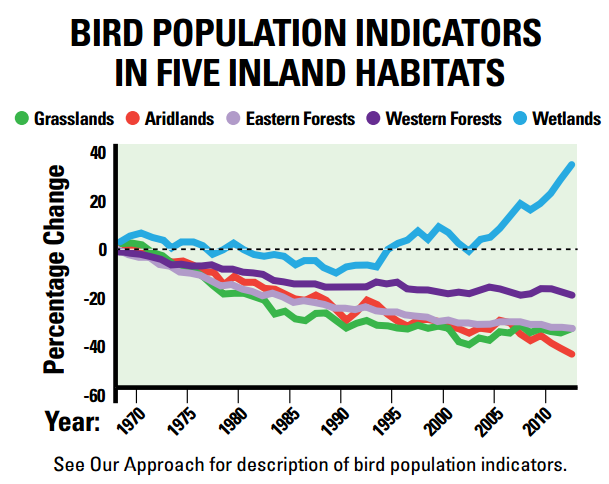 Some wildlife populations in the US – for instance – are rebounding. Condors and eagles are recovering from the ravages of DDT. Wolves in the Yellowstone Park provide an astonishing example of trophic cascade. “The fishes of North America’s inland waters, the most diverse of any temperate region, currently face an unprecedented conservation crisis. The situation with near coastal environments seems even more dire. It results from excessive inputs of nitrogen and phosphorus that have lead to eutrophic conditions in waterways of the developed world for many years. 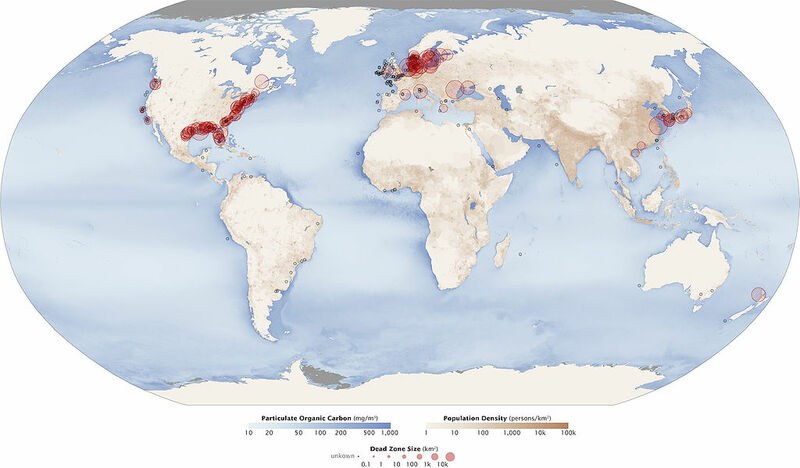 It results in increased number and areas of dead zones in coastal environments fringing areas of the highest population density and development. While fertilisers have increased productivity in the context of declining soil fertility – it does have ecological consequences. 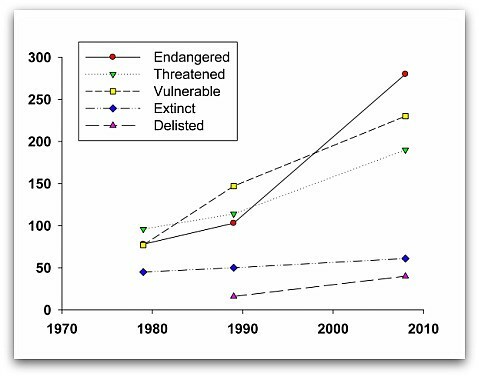 Conservation does happen – but it doesn’t happen in a vacuum. It doesn’t happen because people move to cities. Those people draw in more resources than before – from around the world. The cities eat up surrounding land. They export nutrients and pollutants and increase downstream flooding. Conservation doesn’t happen because of genetically modified organisms or nuclear power. It happens because communities have the resources, the technical know how and the will to change the world. It begins with the most modern theories of human behaviour in management of the global commons. It happens with planned interventions in cities using the most modern techniques of water science and engineering. It happens with modern grazing methods. If you are interested in carbon sequestration – we call this 5 bilion hectares of hope. It is about precision farming. It happens with the most ambitious plans to increase food and fibre production to meet the needs of the near future. It is even about game changing energy sources. Thanks for tipping me off to this. I live in Virginia and camp, hike and hunt. Civil War battlefields are interesting to hike because there are dozens of photos of them taken during the war and you can see a tree-less landscape dotted with houses and shacks where today there are forests and no buildings. This isn’t because they’re all parkland- much of the battlefield area isn’t preserved. You can read accounts of Union soldiers “seeing the church spires of Richmond” from the Chickahominy River. Because there weren’t any trees. You cannot see Richmond today from that river. Where we hunt was farmland that long ago was abandoned back to forest- some planted for paper and wood companies and others just left as the economics of agriculture changed. People left the really rural areas, turning them back to wild. And wildlife has adapted to urban and suburban habitat- I saw a red fox the other day in our suburban neighborhood. My mum lives on the Gold Coast in southern Queensland. Roos sleep in the cool urban forest in the daytime and come out to munch on suburban lawns and parks.